"Super Wonder Boy" redirects here. For the sequel (also called Super Wonder Boy on some releases), see Wonder Boy in Monster Land. (The Hit Squad) 1990 £2.99 ? Wonder Boy (ワンダーボーイ) is a platform game developed by Escape and Sega in 1986 for Sega System 1 and Sega System 2 arcade hardware. Wonder Boy is a sidescrolling platform game, in which the basic goal is to keep heading to to the right, avoiding obstacles, attacking enemies and jumping across platforms. Though it is not a requirement to do so, the game encourages players to keep moving to the right, as health decreases over time and the screen cannot scroll left. Health, and by extension, time, is added to by collecting fruit. There are numerous items hidden in eggs, including hammers, skateboards and fairies which can assist Tom-Tom in his quest. One button jumps, another attacks. If the attack button is held, Tom-Tom will run and be able to jump higher, similar to the mechanics in Super Mario Bros..
Wonder Boy's success in the arcades led to numerous home conversions of the game. Its first home release occurred in later in 1986, when it was adapted it was brought to the SG-1000 in Sega Card format. Due to the limitations of the console (and the chosen form of media), this version has only five stages and omits several enemies, items, and bonus stages. It is also considered to have very choppy scrolling, although features new additions such as a secret weapon and backwards warp-zones. Each of the five stages were also completely redesigned, with the final stage unlike any stage in any other version. The following year, a more arcade accurate version was brought to the Sega Master System. This version, known as Super Wonder Boy (スーパーワンダーボーイ) in Japan, would provide the basis for a subsequent Sega Game Gear conversion in late 1990. In North America, the Game Gear version of the game was renamed Revenge of Drancon for unknown reasons. The Master System version of the game was also made available through the Wii's Virtual Console service in 2008. 1987 also saw the release of several home computer ports by Activision in Europe. Versions for the Amstrad CPC, Commodore 64 and ZX Spectrum were released around the same period, though an Atari ST version (advertised and priced at £24.99) never saw the light of day. The Spectrum version of Wonder Boy would later be bundled with issue 48 of Your Sinclair as Smash Tape 24. Following the release of this game, the Wonder Boy series notably branched off into two different series during the late 1980s. Escape (now Westone) initially signed a deal with Sega which gave Sega the rights to the names and characters featured in Wonder Boy, however Westone still had control over the source code, meaning the game could be brought to other systems in different forms. Westone's contract with Hudson Soft meant that Wonder Boy was brought to the Nintendo Entertainment System and Game Boy under the name of Adventure Island (Takahashi Meijin no Bouken Jima in Japan). Adventure Island was a success for Hudson Soft, and so many sequels were produced starting with Adventure Island 2. Most Adventure Island games build on the gameplay seen in Wonder Boy, and are seen by many to be the true lineage of the series. For Sega, Westone radically changed the Wonder Boy formula with the 1987 release of Wonder Boy in Monster Land, which in-turn led to another split in creative direction. The 1988 release of Wonder Boy III: Monster Lair is often cited as the official end of the classic Wonder Boy lineage - subsequent games would market themselves as sequels to Wonder Boy in Monster Land (Monster World), known in Japan as Monster World II, Monster World III and Monster World IV. 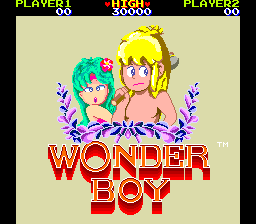 In its original arcade form, Wonder Boy has only been re-released once since 1986 - it was featured in the 2007 release of Sega Ages 2500 Series Vol. 29: Monster World Complete Collection alongside its SG-1000 and Master System counterparts (and other games in the "series"). Main article: Wonder Boy/Magazine articles. Main article: Wonder Boy/Promotional material.